I was re-introduced to this dish by a friend of mine. I was staying with her for the summer and she offer me food that her parents pack for her from home. My first thought upon trying her mom's ga roti is confusion. It tasted so familiar yet I can't seem to remember if I had it before. 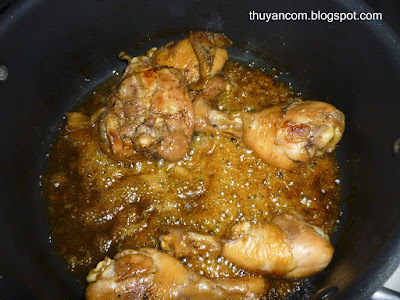 It looks like ga kho (braised chicken) but it has a sweet soy flavor to it. I was instantly a fan! I called my food guru right away, my mom, and asked her why she never made us this tasty chicken. Apparently she makes this very often but just not the same style. Instead of braising, my mom choose to pan fried her chicken. Awesome I no longer feel like I was cheated out of this dish. I gather a couple recipes from my friend's mom, my aunt,and my mom. 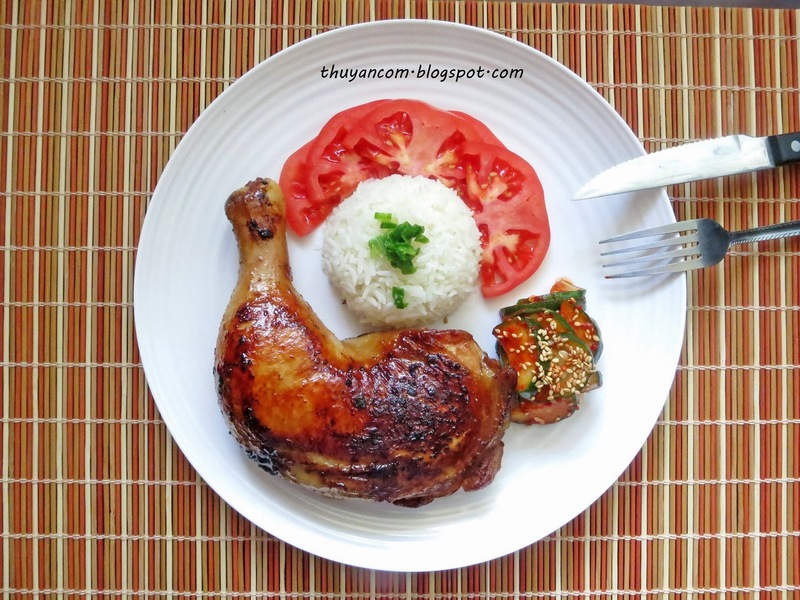 It took a couple of practice round but I am finally satisfy with this recipe. I much prefer my ga roti braised in the soy sauce until it becomes a rich glaze. Drizzling that sweet glaze over hot steamed rice is just heaven. Like the way my mom makes Ga Ragu, I too put coconut juice in my Ga Roti. The end result is just amazing, the meat is so tender that it falls off the bones. 1. Rinse and dry the chicken. 2. Combine all the ingredients except for the coconut juice. 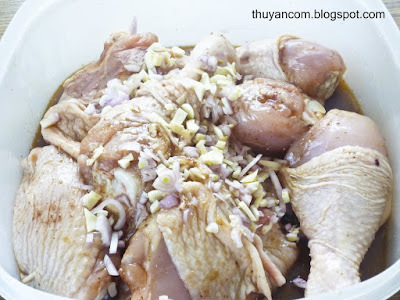 Add the mixture to the chicken to marinade for about 15-20 minutes. 3. Heat up cooking oil in a pan/pot. Pan seared the outside of the chicken, save the marinade for later. 4. Add the rest of the marinade and the coconut juice. 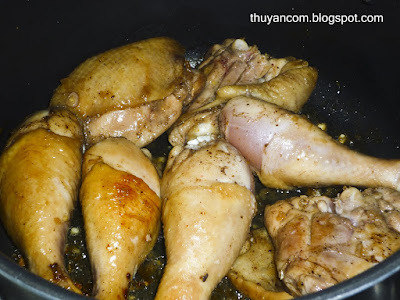 Let chicken cook in sauce on medium heat for about 30 minutes or until sauce thicken into a glaze. 5. Ocassionally turn the chicken from side to side so they sauce will coat the the chicken evenly. Hi Thuy, i have tagged you in the A to Z for your passion of cooking and your yummy Vietnamese food! :) Visit my site and spread the tag :) cheers!